Beading. I love it yet I hate it. There are certain canvases I gravitate towards and my first thought is, "Oh! That (whatever element on the canvas) will be so very perfect with beads. As painted. I don't care how big the space is. It will be perfect with beads. I must have beads." And then I buy ten tubes of beads for the shading, of course, and curse at myself the entire way home. Somehow, I know how to power through with beads. I have two tricks that help me do so. Not everyone agrees with my tricks. But, I've been doing it this way for close to 20 years and it works. The first is transparent thread. Transparent thread eliminates the need for multiple needles (with different color threads) or the time-consuming chore of changing threads on the needle. I can shade to my heart's delight. I used to find transparent thread at the local drug store in the now rapidly disappearing sewing section. I've seen transparent thread at local needlepoint shops, but find it is very expensive. I now buy it at my local fabric store. The second trick is to align the individual rows of beads by returning the needle through the entire row after it is complete. This is a tried and true method for me to bead. Don't get me wrong. There are occasions when I buy colored beading thread. I use it to reinforce a color in an area, especially if it is a small space or brick beading. More often than not, if I am adding a single bead to an already open space area, I will use colored beading thread. 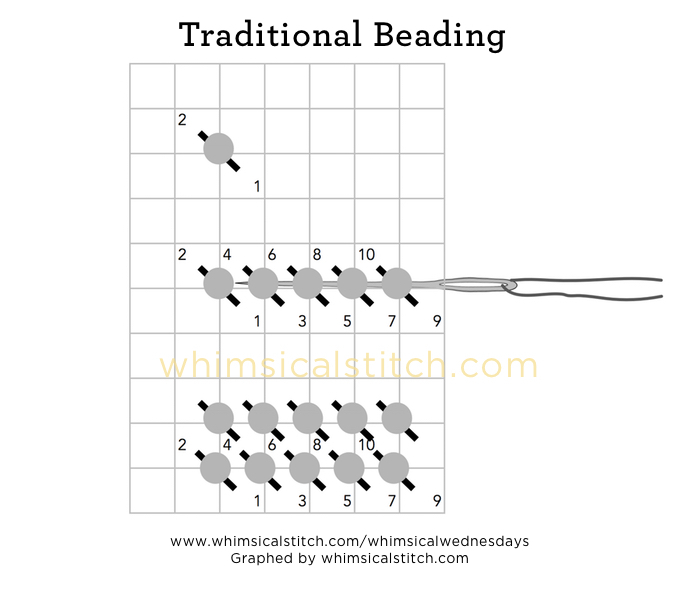 I hope this post helps you reconnect with beading. Thank you for stopping by! 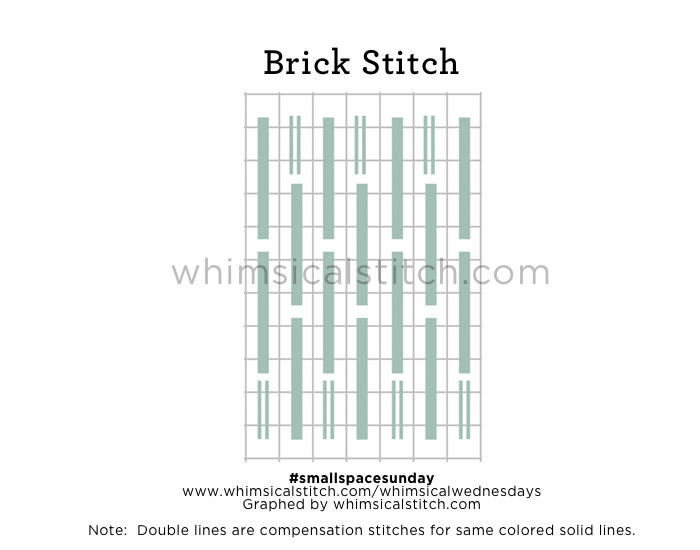 This week's #smallspacesunday post shares the Reverse Basketweave stitch. What I love about this stitch is it adds texture and some dimension to a small space, all the while keeping it very neat and clean. Consider it for a small basket, hat, gloves, ground cover, bushes (in the background), lamp base, side table, small fruits or vegetables...you get the idea. Like other small space stitches, this stitch works well with overdyed threads as it merges the various hues of the thread well and doesn't overpower a piece. It is a great stitch to use if you want the shading to show through. To accomplish that, use a very light thread weight based on the canvas mesh you are using. For example, use Elegance on a 13-mesh canvas or Kreinik Metallics Very Fine Braid (#4) on 18-mesh. As an example, I use this stitch frequently for window glass, especially with a Kreinik Metallic. I use Kreinik Metallics color 032 (Pearl) in a Very Fine Braid (#4) on 18-mesh and Fine Braid (#8) on 13-mesh. It provides the shiny look of glass all the while allowing the colors of the window as painted to show through. I hope you enjoy the Reverse Basketweave stitch. Let us know where you use it so we can learn together! Beetle Stitch, you are fantastic. You are a wildly versatile stitch in both use and pattern. Let's start with the base pattern. A simple pattern to follow...over 2-2-2-4-6-6-6-4 and repeat. The diagram shows the horizontal version, resulting in columns. The two's always match the sixes and the fours always match the fours in subsequent columns. You don't have to skip a row between columns, or you can skip multiple rows. It's a great dressed down stitch, but it dresses up really well when you skip multiple rows. In this example, I combine threads to get a more elegant effect. The gray lines are a matte thread and the aqua lines are a soft sheen metallic such as Kreinik Metallics #8 (or #12) braid or Rainbow Galleries Flair or Fyre Werks. I like to use those metallics, regardless of canvas mesh size, as they lay well on the canvas and don't overpower the space. You can use the same color family for a more subtle elegance or complementary colors to make the area stand out a little more. The last scenario uses multiple hues. This is a perfect strategy for those canvases without a painted background. Melissa Shirley's Mary Lake-Thompson line of fruit bowls, teacups, baskets, and fruit canvases are great examples of those canvases. Use three complementary colors for the canvas and create a subtle but impactful background to the piece, tying the colors of the piece together. 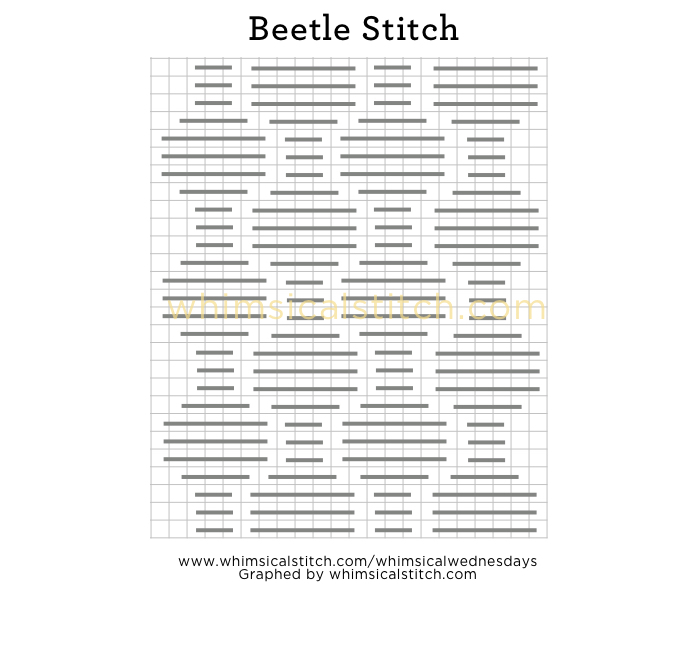 The Beetle Stitch is great for a large background, sky, water, large space clothing (such as Santa's coat), bag, or floor covering, to name just a few. This stitch is great as a full cover stitch but also a wonderful light option. For example, the use of a lighter weight metallic (versus the canvas size) highlights the shading of the painting on the canvas. 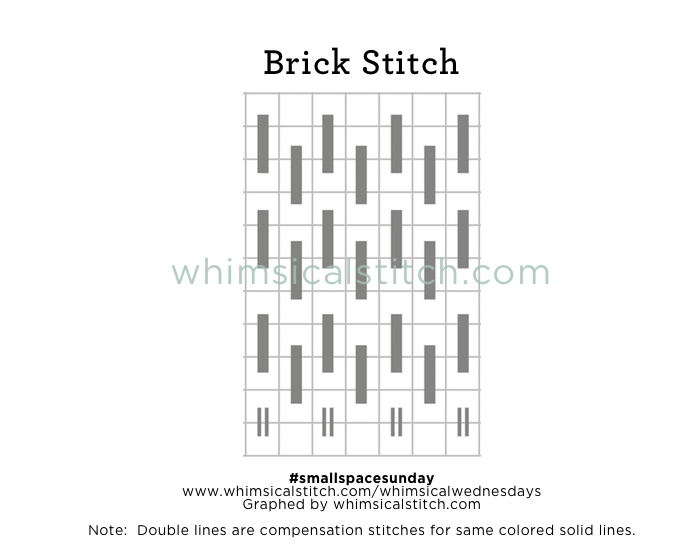 #smallspacesunday found a new (to her) small space stitch. I found this truly unique small space stitch while looking for a stitch to do a cushion. It was a beautifully shaded cushion, and I was leaning towards stitching it as painted in plain needlepoint...until I found this stitch. I named it the cushion stitch, as that was its inspiration. However, it can serve many purposes. It would make excellent tree bark, roof, ground covering, bush, coat or jacket. For my cushion, I used three different threads of the same color family. For the aqua lines, I used a pliable wool. I used Neon Rays for the dark gray line and Frosty Rays for the light gray line. I think it would be great fun to use this on a coat in three different colors as diagrammed. 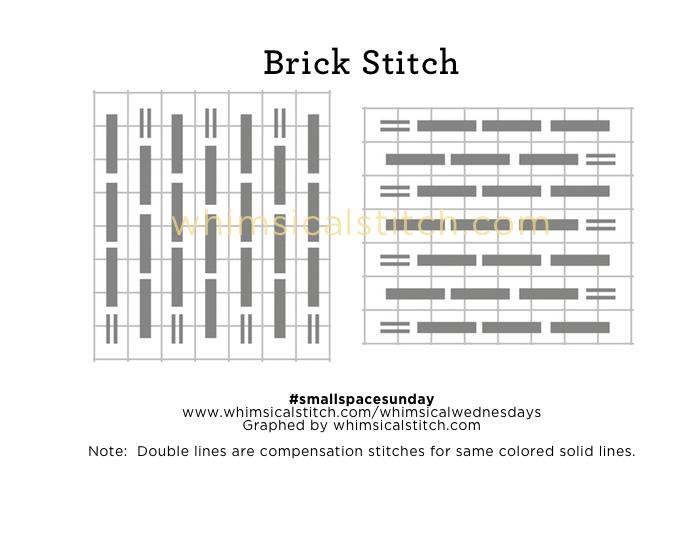 This stitch diagram, along with other #whimsicalwednesday and #smallspacesunday stitch diagrams, can also be found on www.pinterest.com/whimsicalstitch/whimsicalwednesdays. I hope you enjoy this latest find as much as I do!